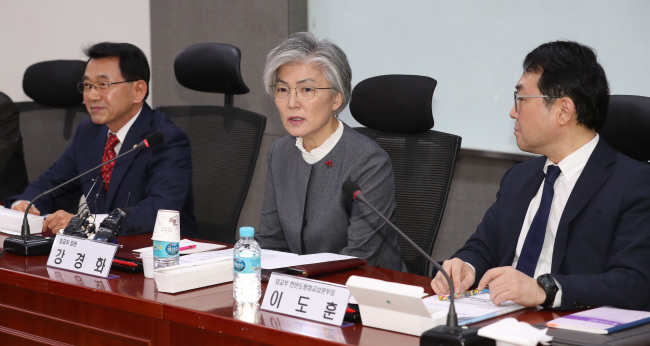 South Korea's Foreign Minister Kang Kyung-wha said Friday that she does not rule out the possibility of a surprise announcement on a much-anticipated summit between the United States and North Korea. Kang made the remarks amid hopes that the possible second summit between US President Donald Trump and North Korean leader Kim Jong-un will create fresh momentum for diplomacy on Pyongyang's denuclearization and a lasting peace on the peninsula. "Major US figures have hinted recently that there has been communication between Pyongyang and Washington over the possible second US-North Korea summit," Kang wrote in a pre-released script for a lecture hosted by the ruling Democratic Party's special panel on denuclearization. Trump has recently said that the summit location will probably be announced "in the not-too-distant future." In his New Year's speech, Kim voiced his desire to meet the American president "anytime." Kang pointed out that there need to be "close communication and consultations" between the relevant countries ahead of a series of major diplomatic events, including the Trump-Kim summit and Kim's possible trip to Seoul. Commenting on Kim's summit with Chinese President Xi Jinping in Beijing this week, Kang said that the two leaders' latest meeting showed the close friendship between the communist allies and that it served to deepen their strategic communication ahead of Kim's summit with Trump. As for Seoul's role in peace efforts, Kang noted the need to strive for "dramatic progress" in inter-Korean relations and efforts to denuclearize the peninsula if Kim makes an unprecedented trip to Seoul.